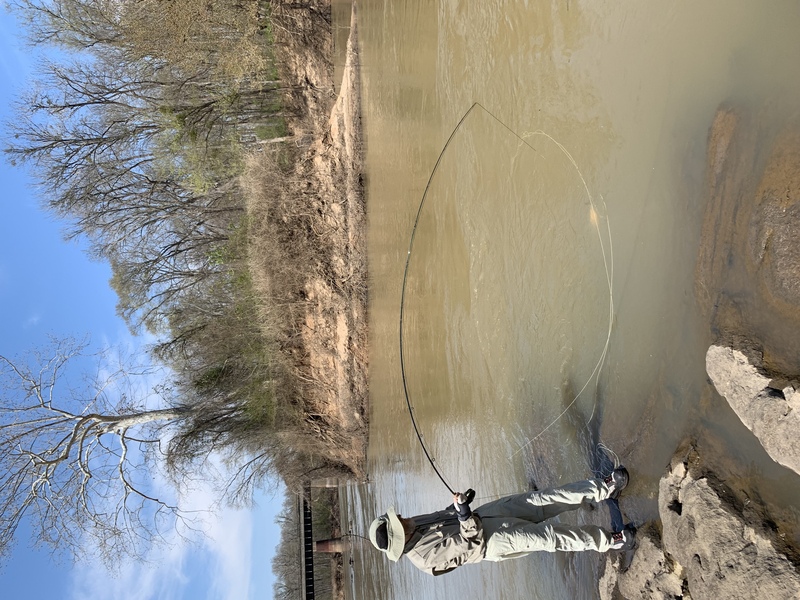 The last couple of years weren’t good for making the trip to Weldon to catch shad on the Roanoke River. Either the water was too high, or too cold, or the few good days didn’t mesh with my schedule, or Sam’s. However, we finally got a beautiful spring day when we could both make it, and the fish were there. I drove from Emerald Isle and met Sam in Weldon. It’s about a 2 hour 45 minute drive for me, and about 2 hours for Sam coming from Durham. We met at 10am. I brought the Mad River canoe with me, as our plans were to fish from the rocks, and we wanted to get to the far side from the boat ramp. We got in position by 11, and fished until just after 3. The action was steady. We’ve caught more fish some years, but rarely so many big strong ones. 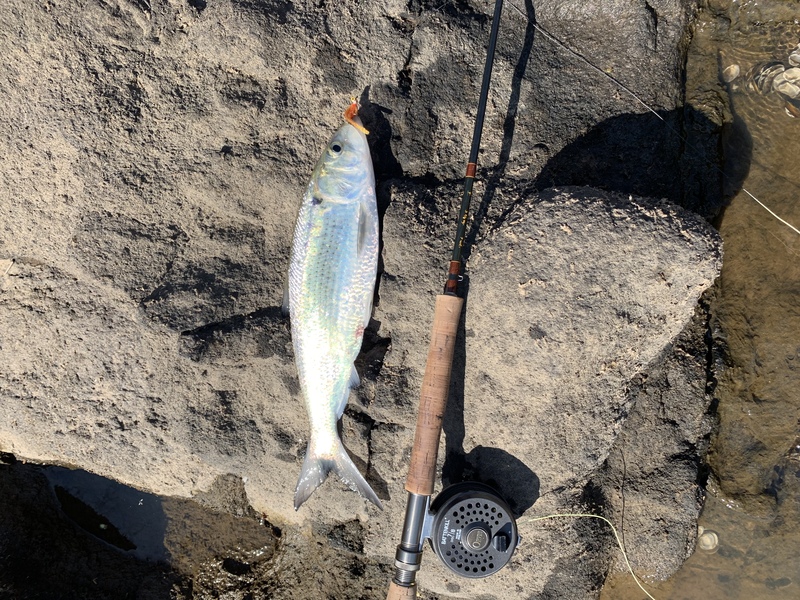 We caught fish on orange flies, pink flies, green flies, and even some on shad darts on the spinning rods, too. The beers were cold, the day warm, the fishing good, and we enjoyed watching the ospreys plucking shad out of the river. This entry was posted in Uncategorized on March 29, 2019 by joel. I’ve been sitting this evening, reflecting on energy and the Dunn household. Since our solar system went live on April 17, it’s produced 2.28 megawatt hours of power (equivalent to 2,280 pounds of coal!). 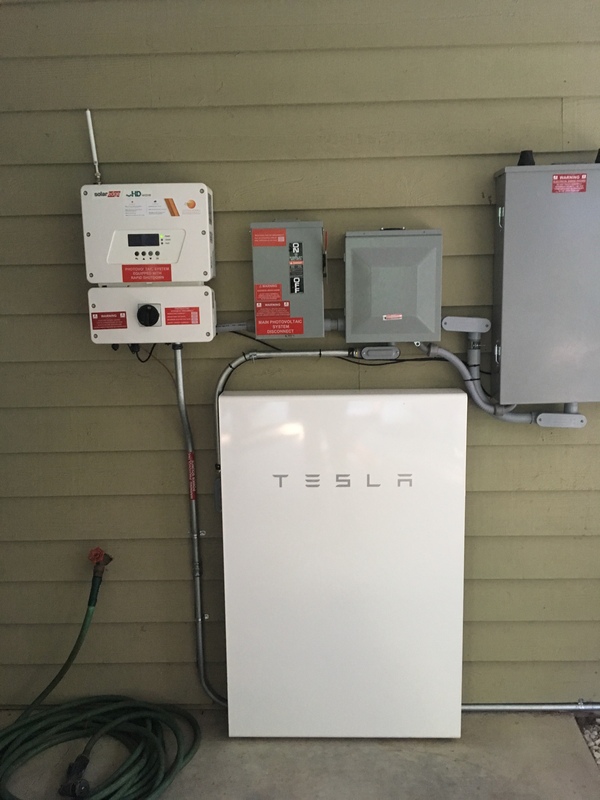 The potential production was probably 200-400 kWh more, as we don’t have net metering and the Powerwall was not installed until early July. Our consumption during this same period was 6.86 megawatt hours, so the solar system produced a third of the power used by the house. However, another consideration is that our all-electric car, a Chevy Bolt, used 659 kWh from home charging (about 3,000 miles of driving) during the measurement period. That’s less than normal, as we were traveling for several weeks during this period. If you factor this out, the solar covered about 37% of the other household consumption during a hot summer with the three air conditioning units running many hours per day. During the next 3 months, I expect the solar percentage to increase substantially as the air conditioning load drops, before heating season begins in December (hey, it’s usually mild here). Whether you reduce your power consumption by changing to LED bulbs, installing new windows, doors, HVAC systems, or by generating some of the power you need, we can all help to reduce fossil fuel usage and reduce greenhouse gas emissions. Climate change is real, and together we can make a difference! This entry was posted in Uncategorized on September 3, 2018 by joel. Saw a good statistical summary of electric vehicle (EV) sales for 2017. Nearly 200,000 battery electric and plug in hybrid vehicles were sold in the US in 2017, up by 26% from 2016, and 1.6% of US sales in December. Estimates are that we’ll see sales of 300,000 in 2018, depending on the Tesla Model 3 rampup, and vehicles like the new Nissan Leaf, and the Chevy Bolt. The EV is probably still not an “only car” for most folks, but as a second car, it will fill a lot of niches with current and emerging products. This entry was posted in Electric vehicles, Uncategorized on January 11, 2018 by joel. I tried for the “Clearwater trifecta” of a trout, largemouth bass, and a bream. I caught the largemouth but never landed the bream. 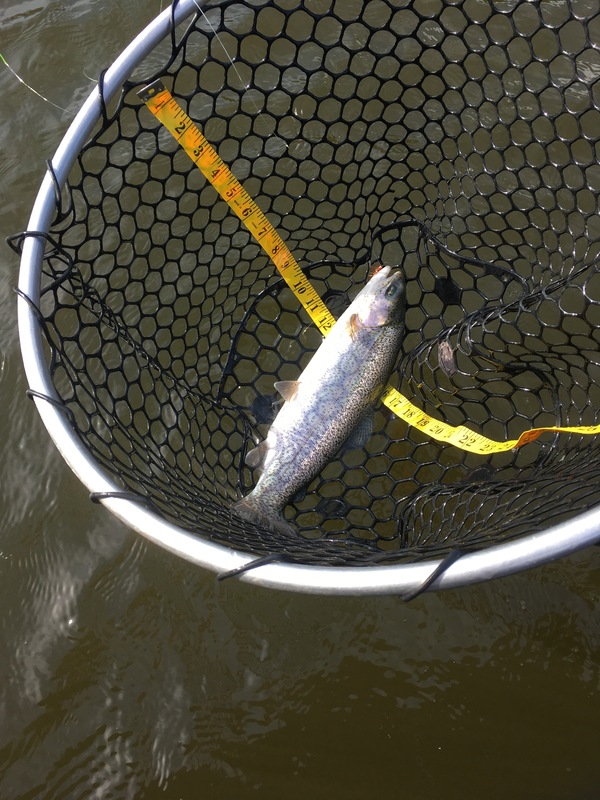 Sam worked hard and finally connected using size 20 midges under a a CDC. 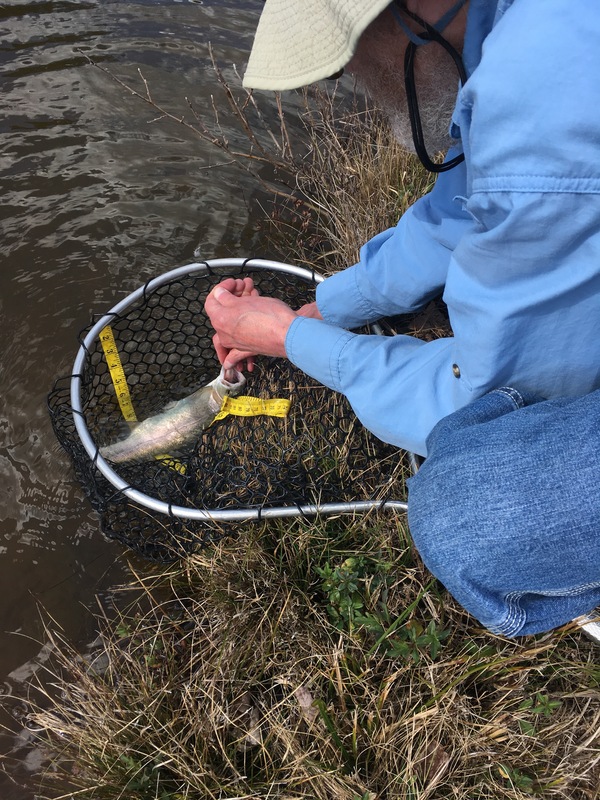 Thanks to TU and the YMCA for making it possible for me to catch trout 15 minutes from my driveway. This entry was posted in Uncategorized on February 25, 2017 by joel. Its been a week since I put up a TV antennae at the beach house and dropped the Time Warner Cable subscription back to Internet only. Faithful readers of this blog know that it’s now been 4 years (July 2011) since I put up an antennae on the Chapel Hill house and dropped Uverse. I used the same configuration at Emerald Isle as in Chapel Hill – a ChannelMaster 4228HD antennae and a ChannelMaster 7777 preamp. This has been a while in coming, but with TWC raising rates once again, it was time to jump. We’d been paying $105 for non-digital cable and standard 15×1 Internet. TWC said the new rate would be $130, and would require a digital converter on each set. Enough! Internet only is $45 plus tax, so say $50. That’s $80/mo, or nearly $1000/yr for basic cable. Do we watch that much? Nope. In fairness, we do pay for multiple streaming services, but we can use those in Chapel Hill or EI. Since we were already paying for these, it’s moot. We subscribe to Netflix, HBO NOW (for Game of Thrones), SlingTV (for ESPN). These are about $45/mo. We have a TiVo in Chapel Hill for $15/mo, so that’s $60 total, but it’s flexible and portable. Putting up the antennae/amp is about $200, plus cabling, which can be done for under $50. At $80 /mo savings, that’s a 3 month payback. Technically it’s easy, and you can feed all the TVs in your house using the old splitter in the TWC box on your house. If you have only one TV, an internal antennae for $50 can work, but for several sets, you need to feed the distribution system. For reception, at EI, I’m picking up stations 50-70 miles away with clarity. WITN, WNCT, WCTI, WUNK and others. So, if cable is getting you down, there’s an alternative! This entry was posted in Uncategorized on August 21, 2015 by joel. This entry was posted in Uncategorized on March 18, 2013 by joel.